Tom Green, The Introverted Sculptor, 1984. The American University Museum at the Katzen Arts Center will kick off its 2010 season on Saturday, January 23, with the first exhibition to feature nearly 40 years of work by renowned D.C. artist Tom Green. Green taught at the Corcoran College of Art and Design for about 35 years and has been extremely influential in the Washington, D.C., art scene. During his tenure at the Corcoran, Green led a new generation of artists out of the dominance of the Washington Color School toward a more personal process and iconography. The Washington Color School was defined in the 1950s through the 1970s by an influential group of D.C. based artists, including Kenneth Noland, Gene Davis, Morris Louis, and Paul Reed, who were central to the Color Field movement—an abstract art movement that broke from abstract expressionism by creating formal compositions of large unmodulated areas of color in monumental scale. Green and Jack Rasmussen, director and curator of the American University Museum, were colleagues at the Corcoran. 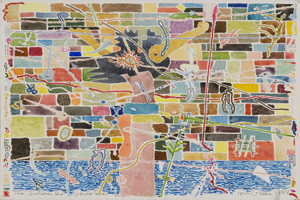 Green experienced early success in his career and had works in prestigious shows at the Whitney Museum of American Art and the Guggenheim in New York City. Despite this, he continued to devote himself to making art rather than chasing fame. Rasmussen recalls a distinct, lifelong habit of Green’s that underscores his devotion to his art: Green always has a black sketch book with him and is always drawing in it, documenting his ideas. In addition to Tom Green: Accident and Intent, three other exhibitions will open at the American University Museum on Saturday, January 30. Alan Feltus and Lani Irwin: Personal Interiors presents recent work by two artists with ties to AU’s Department of Art who now live and work in Assisi, Italy. Feltus was a faculty member and Irwin is an art alumna. The exhibition features paintings, drawings, and collages that reveal relationships of the figure in still, intimate spaces. Robert Devers: Cult of the Hand is an interdisciplinary exploration retracing and reimagining the influences of culture, craft, and place on the artist. Through the multicultural perspective provided by the history of maiolica glaze painting (tin-glazed pottery that originated during the Renaissance), Devers maps his own journey in the form of paintings, ceramics, and installations to offer a new translation of pattern, form, and space and to provide new perspectives of cultural influence as an American artist working in Mexico and Italy. Cream: Washington Project for the Arts Art Auction Exhibition features work by Washington Project for the Arts member artists, as well as national contemporary artists selected by top curators from some of the most important art institutions in the country. Cream: Washington Project for the Arts Art Auction Exhibition closes on Sunday, March 6. The remaining three exhibitions close Sunday, March 14. A series of free programs, including gallery talks, will be announced separately.